As I promised in my last post, here is the recipe for the wonderful Salted Caramel Lava Cake I made on the evening of my book club get together. Couple of months ago for my birthday, my children made me a wonderful lunch of Stuffed Gnocchi and Salted Caramel Lava Cake. I’d seen many molten lava cake blog posts, sighed at the beautiful pictures knowing that it was not in my destiny to make these exotic gooey cakes. Firstly, I am not into baking, secondly I avoid recipes with eggs. However I was so inspired by the kiddies effort and their creativity in making a salted caramel version [because I love salted caramel much, much more than chocolate] that I decided to give it a try. But they hadn’t saved the recipe! Well, that gave me an excuse to blog surf for lava cake posts. What a wonderful chore it was! 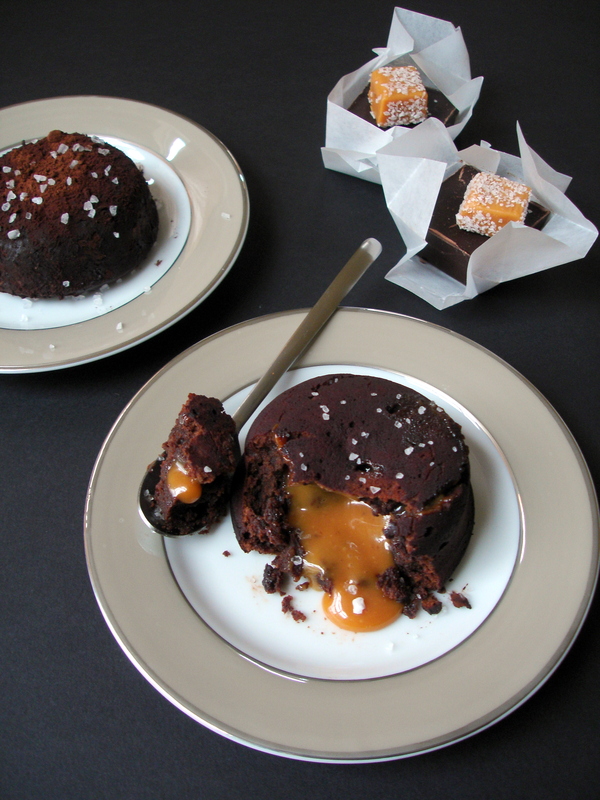 I found two chocolate lava cake recipes which I used as a guide to make my Salted Caramel Lava Cakes. Cut each caramel square into a few smaller pieces and press some salt onto them and set aside. If you leave them whole they might not melt all the way through. Microwave the chocolate squares and butter for one minute in a large bowl. The chocolate will not have completely melted at this point. Whisk till the chocolate and butter combine. Whisk in the eggs and incorporate. Stir in the flour. Work the flour in gently to combine. Divide batter among the 4 ramekins. Place ramekins on a cookie sheet and bake between 10-14 minutes. The cake is ready when it has a domed appearance, the center is a little moist and the edges of the cake, dry and firm. Remove from the oven, insert a knife and go around the cake, invert onto serving plates, garnish wth salt and serve. This is a very forgiving recipe and you can’t go wrong with this cake. Please do keep this in your repetoire. For very little time and effort you get outstanding results each and every time. You can make the batter ahead of time and refrigerate it. I’ve baked it after 3 three days. Not necessary to get to room temperature, just leave it out for a little while. You can even put it in a prepared ramekin, refrigerate and bake directly after you have set it out for a little bit. You can freeze the batter. Thaw and bake. You can also freeze in prepared ramekins, then thaw and bake, though the cake didn’t rise as much. You can spike it with liquor. If you have left the cake in the oven for a bit too long, it might not have a runny center but the inside will still be moist and fudgy and still yummy. The same recipe bakes equally well in a mini muffin pan. I set the temperature to 350 degrees [180degrees celcius] and baked for 10-12 minutes. For a chocolate lava cake, just omit the caramel squares. UPDATE; I used ‘Fleur De Sel Caramel’ from Trader Joe’s and I got much better results than Kraft Caramel Squares which I used originally. I didn’t have to cut up the caramels as I did with Kraft and the center was unbelievably gooey. I am adding a link to Grace’s blog post on this cake. She is a reader who has shown step by step photos of the making of this cake. Please drop by her charming blog and see the recipe come alive. Love the composition of the first picture. Beautifully presented. Oh my god, this looks amazing and everything like Id imagined it to be when you described it to me. Salted caramel anything is spectacular and this lava cake looks out of the world. Gorgeous pics too. Can’t wait till I have a kitchen so I can try this! Gorgeous Pix Sandhya, love the contrast of the caramel squares 7 the finished product!! Looks just like what I was looking for to make for my sister’s birthday. So glad to hear that. Please let me know how it turns out. Really, the recipe is that simple that no one can go wrong [careful attention has to be paid to the time in oven though]. Sometimes when I feel I need some salted caramel, I improvise, just press some rock salt onto caramel squares and I am satisfied! Hi Asya. Nice to see you here. Hi! What a decadent cake! I usually use a few splashes of evaporated milk as a substitute for eggs – any thoughts on whether it would work in this recipe? Hi Amarjit, welcome to my blog. I usually bake eggless but for this one especially because of it’s small size I feel going eggless would make it dry. I adapted this recipe from others and used as few eggs as possible to get max gooey benefit. Do let me know if you try it your way and how it turned out. Love this! Ive made molten lava cake before but I’m gonna give this salted caramel one a try too! Yummy. Hi Tia, would love to hear about your results. oh wow…this looks seriously insane. I need to try this! thank you so much for sharing! “Best dessert ever” said my husband. Incredible! My caramel didn’t melt very well even after I cut it up. I think next time I might ‘nuke it for a few seconds to give it a bit of head start. Because they will be made again! So easy! Ultimately, testimonials like this is really what validates a recipe. Thank you so much. Great idea to prep the caramel ahead of time. Looks amazing! I can’t wait to make these! Please do drop by to let me know how they turned out, will you? Thanks, so much Jeni. These look fab! What kind of caramel did you use? Thanks, Kim. I used Kraft caramel squares. You can try “Fleur de sel caramels’ from Trader Joe’s as they are softer. I am planning on trying them next time. Is there a difference between the Kraft vanilla caramel and Kraft traditional caramels? Sorry, I haven’t tried Vanilla caramel. Such a yummy looking recipe! I need to get caramels and give it a try. This may be a silly question, but what is “AP flour”? Sorry about that, I am going to edit the post to clarify. AP = All purpose or regular white flour. Cld u pls let me know what size ramekins u used? I love this recipie, not sure which cups to use tho, i have some that are 5 oz and others that are 4 inches? I used a 3″ diameter ramekin. Thank you for this wonderful recipe! I made these last night and they were a huge hit and incredibly easy to make! Just made these for my parents and boyfriend, and they loved them! Thanks for a great recipe! Very happy to hear that, Natalie. what size ramekin did you use? Hi Lindsay, I used 3″ diameter ramekins. I also baked a batch in a mini muffin pan, while it was wonderful, no oozing caramel in this size. I made these and they turned out rich and delicious. I cut my caramel pretty small and still had problems with them melting, but it still tasted great. Tomorrow, I’m going to try and make them with peanut butter in the middle for my roommates birthday. I forgot to mention that I made them with all purpose gluten free flour(King Arthurs GF) and a tsp of Xanthan gum and it worked super well. Oh cool, so this could be called a gluten free cake? You know the funny thing is the caramel melted most of the times but not sometimes, I can’t figure it out. I am planning on trying a caramel softer other than Kraft’s but haven’t had the time. What a wonderful idea to add peanut butter to it. Thanks Heather. Yes it could be called a gluten free cake! Lava cakes are wonderful and sinful and yummie and everything. But filled with caramel.. wohooooo! for a dinner party, when should you bake it? If you bake it too soon for dessert, will the caramel harden? 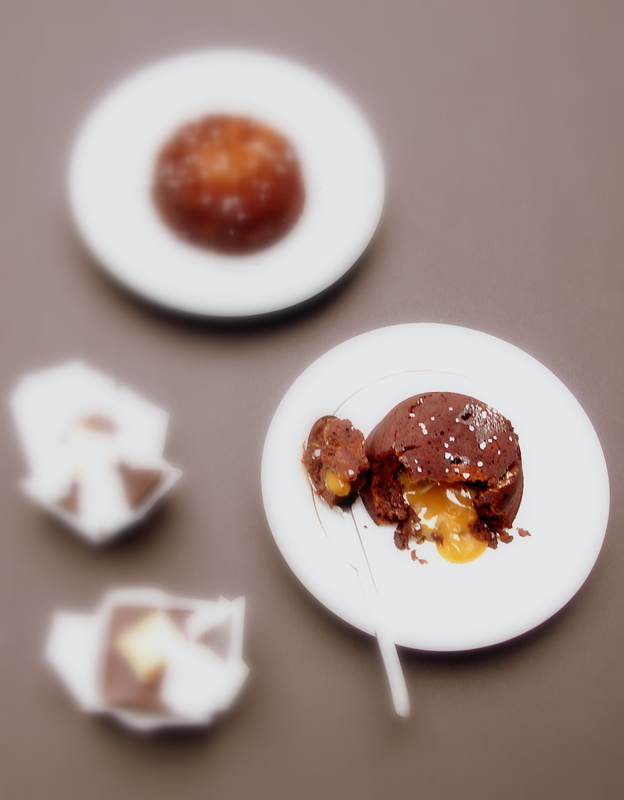 The molten effect is best when the cakes are right out of the oven. I prepare my ramekins ahead of time with the batter, put it on a baking tray and set it on my counter. !5 minutes before serving I put the tray in the oven which is enough time to bake and un mold onto plates. If the cakes are baked before start of dinner then the centre is moist but not runny. I have not experienced hardened caramel. I used Kraft’s caramel squares and sometimes not all of it melted. I am planning on trying a softer caramel like Trader Joe’s. Good luck, I would love to hear how it turned out. This looks amazing and I will try tomorrow! Now, any ideas on how to substitute the chocolate to make a yellow cake with salted caramel instead or would I need a whole different recipe for the batter? Never thought of that before. How about using a boxed yellow cake mix instead of flour, but keeping the rest of the ingredients and qty’s the same. I suspect the cakes might turn out a little fluffy. Please let me know how your trial went. Sounds great, I will try it and will let you know!!! Aww…now you’ve got me thinking about trying a non chocolate cake with caramel. Will post if I succeed. Thank you so much for this recipe! It is absolutely perfect!!! I featured your recipe on my blog today and included a link to your blog as well! Thanks again! Wow Grace, such detailed step by step photographs. I am so impressed and flattered. Thank you. I have added a link to your post on my blog so my readers can hop over and see your detailed pictures. Since I don’t have small ramekins, I was thinking maybe to use a muffin baking pan. The size should be fine. I I’d think the “what it does to the dough”- attributes while baking should be the same to? Anyone tried it this way? I have baked in mini muffin pans, see bottom of ‘Food Notes’. I reduced the temperature and cooking times because of size and metal. Baking in larger muffin pan, while I haven’t done so, maybe at 400 deg? Hi, thanks for the quick answer! I’ve made them yesterday and they were delicous:-) Great and really easy recipe! You just made my day. It is wonderful to hear such great feedback on recipes from readers, so thank you very much! These were so easy to make and very delicious! Thank you for the recipe! So impressed with all the work you put into your anniversary meal. Glad my salted caramel lava cake played a small part. Can chocolate chips be substituted for chocolate squares? Can’t wait to make this-I have 2 bags of chocolate chips. I haven’t tried it but don’t see why not.Measure by weight, and hopefully it will work. Do let me know how it turned out. Did you use the caramel sauce from Trader Joe’s or do they actually have caramels? I have the caramel sauce just didn’t know if they have caramels. I used the caramel squares from TJ’s, it may be a seasonal item if you can’t find them. You can try Kraft squares which are readily available but don’t melt completely in the short time it takes to bake. So I cut it up and insert it. let me know what you used and how it turned out.